You’re reading down the recipe and come to “juice of one orange” but you’re left stuck not wanting to buy a bag of oranges when you’ve got orange juice in the fridge already right? Or for whatever other reason you want to know how much orange juice is in one orange don’t worry I’ve got you covered. And I won’t go into “it depends yadda yadda” because I’m sure you already know that, but if the recipe says juice of one orange it means you don’t need an exact amount. 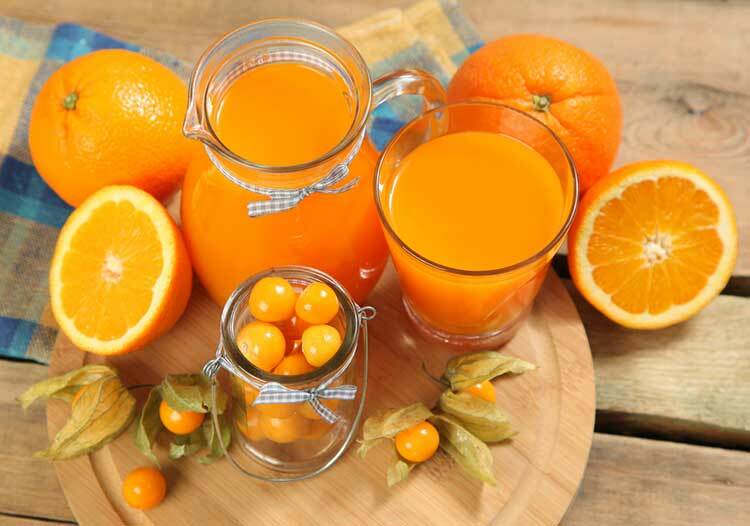 One orange will get you about a third of a cup of orange juice, which is about 75 ml or 5 tablespoons. Could be a little more if you’ve got a big juicy orange, could be a little less if you’re juicing it by hand rather than with an electric juicer. But it’ll be round about a ⅓ cup and if you go with that in a recipe I’m sure you’ll get on OK. If you’re wanting to get the most juice then you’re going to need one of the best oranges for juicing which in this case is going to be a Valencia orange. Valencia oranges are in season 9 months of the year from April to December and are the commercial standard for drinking orange juice. They’re big, they’re juicy, and generally really widely available so you can pick them up cheap. In the height of summer they can go a little green on the outside but don’t worry about it, they’re still ripe, they just do this to protect themselves from the sun. These will give you a ⅓ of a cup or more of juice while navels and other varieties will be more like ¼ to a ⅓ cup. Warm it First – Fruit tends to be less juicy when it’s cold, so to get the most juice out of your orange, especially if you’re juicing it by hand, you’re going to want to warm it a little. You can do this by rolling it around in your hand, or prick the skin with a skewer and put it in the microwave for about 15 seconds. This just warms it up and gets the juices flowing so they come out easier. Get an Electric Orange Juicer – Of course if you’re doing it by hand there’s only so much you can do, but with an electric orange juicer you get twice the juice at a fraction of the effort, you just put it on the juicing cone, push the lid down and it spins away getting every last drop out of it. How Many Orange in a Glass of Orange Juice? Finally, for a glass of orange juice you’re going to want to allow for 1-2 lbs of oranges, but it depends on how big a glass you want, I go by 250 ml as a good glass size, because 8 of them and you’re recommended water for the day. So if one orange has 75 ml then you’re going to want to get 4 oranges to make up a glass of orange juice. But again it depends, blah blah blah. So once again, you are 1/3 of a cup or about 75 ml of orange juice in a single orange. Hope that helps!